It is common knowledge among steam fans that the UP roundhouse in Cheyenne, WY is the home base for UP Northern 844, UP Challenger 3985, and now UP Big Boy 4014 from Pomona. However, there are two other Union Pacific steam locomotives stored in the UP roundhouse in Cheyenne which are unknown to many people. These two locomotives are UP FEF-3 (4-8-4) 838 and UP TTT63 (2-10-2) 5511. Since neither were donated to be display in city parks, neither appear in Union Pacific's list of donated steam locomotives and both remain out of sight inside the UP roundhouse in Cheyenne. After retirement in 1961, 4014 was displayed for many year in Pomona, CA at the Los Angeles Country Fairplex. In 2012 it was announced that the 4014 would return to Cheyenne, WY for restoration to operation by the Union Pacific. See this page for more details. 3985 was retired from active duty in 1962. 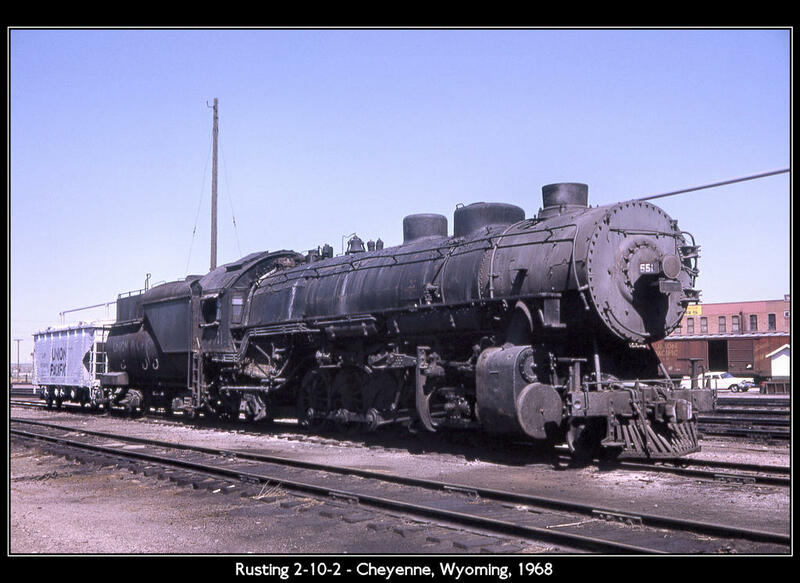 It was stored in the Cheyenne roundhouse until 1975 when it was put on display next to the Cheyenne depot in 1975. After only four years on display restoration efforts began to bring her back into operational condition. 3985 pulled many excurion trains until 2010 when it was put back in storage in Cheyenne. It is scheduled to undergo restoration back to operating condition once restoration efforts on Big Boy 4014 is completed. 844 is the only North American Class I steam locomotive that was never retired. UP's commercial operation of steam may have ended in the 1950s. However, 844 was retained by the UP for special duties. From 1962 to 1989 it was renumbered to 8444 because an EMD GP30 carried the number 844. That diesel has since been retired and put on display at the Nevada State Railroad Museum in Boulder City, NV and 844 now carries its original number. With 80 inch drivers, these locomotives were built for speed. While UP's timetables would routinely show speed limits of 80 mph for these locomotives, I had spoken to one former "800" (as the crews referred to them) engineer who told me that he had no problem occasionally bring these up to 120 mph. UP 838 was sent from Omaha to Cheyenne in 1977. From that time on, it has been used as a parts supply for the famous UP Northern: 844. It has been said that the running gear and boiler of 838 is now in better condition than that of 844 because of 844's extended use, although it is beyond economic repair. Perhaps one day 838 will be put on display. There is a photo of 838 in two-tone gray in the April 30, 1999 issue of Classic Trains on page 22. I would be interested in any other photos or information about this locomotive. In its last years of use, 5511 was used as a stationary boiler at Ogden, then at Green River. Such use was very hard on boilers as they seldom received blow-downs and in general were not watched as closely as they were when used as a steam locomotive. Its piston rods were cut (see photo on the right) when it was towed from Green River to Cheyenne for storage and possible scrapping back in 1968. During that trip it developed a "hot box" had to be set out to be repacked. Cutting the piston rods was standard procedure when preparing a locomotive for the scrapper's torch. The drive rods would be left on so that the drivers would be balanced during transport but the main rods would be severed so that there would be no chance for the pistons to bind which could cause a derailment. 5511 arrived in Cheyenne but was fortunately saved from the cutters torch possibly because it was featured in the movie Last of the Giants made by UP about the Big Boy locomotives. 4-6-0 1243 (which had been towed from Rawlins in 1968) was also featured in that movie and was also stored in the UP roundhouse for many years before being sent to Omaha for display. I have heard conflicting information regarding 5511's current condition. One report stated that 5511 is not in very good mechanical condition. The report stated that most of the cab appliances have been removed (although they could have been removed by UP staff, I don't know). It went on to say that since returning from Green River, 5511 had not had a hydro test or any kind of boiler inspection and its condition was a bit of a mystery. A more recent report stated that the steam crew looked at the boiler and "ran all sorts of tests" and concluded that it would not take much work to restore it. Whatever its current condition, as a candidate for restoration it is very poor. It was built as a "drag" locomotive. Its large cylinders and small drivers would limit its speed. In service the top speed of this class of locomotives was 45 mph. It has a very long wheel base, longer than that of 844. Contrary to what some people have told me, Steve Lee of the UP steam program has informed me that the center driver is NOT blind. It has friction bearings (which is another strike against any restoration efforts). It has a small tender, limiting its range. In all, it would not be a very useful locomotive to have running. In 2004 I heard that this locomotive would be offered for sale but I do not believe that ever happened. The UP shop crew would like to get it out of the roundhouse and into a museum somewhere. After all, because it is the last if its class and it does have the "not-so-common" Young valve gear, it would make a great museum display piece. It hasn't been moved much over the years except to pull it out of the roundhouse for a Union Pacific Historical Society convention a few years ago. Cosmetically it looks pretty good since the shop crew painted it for the convention and posed it on the turntable for photos. In my opinion an opportunity was missed with this locomotive. In trade for UP Big Boy 4014 going to Cheyenne, the Rail Giants Museum in Pomona received an operational diesel. I don't have any "inside" information on how it was decided to receive a diesel in exchange for the Big Boy, but it seems to me that 5511 would have been the perfect replacement for the Big Boy. If 5511 is ever displayed in a park, it would begin to deteriorate. The only appropriate place for 5511 is in a museum where it would be given the care it deserves. The people at the Rail Giants Museum take excellent care of their locomotives. They also have a rare collection of one-of-a-kind locomotives. 5511 would have been a perfect addition to their fleet of unique steam. I, for one, would have been keen on seeing this locomotive displayed there.